I have been an avid backyard gardener for the last 7 years or so. For the first 5 years or more, I had no idea what I was doing. It was all a big science experiment. 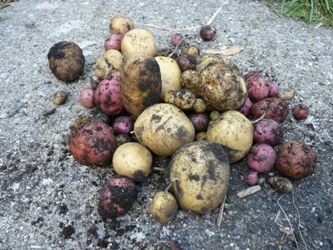 My yard and my veggies were my subjects. Some years it worked out and some years it didn’t. The blueberries did well (I had advice from my uncle who has grown blueberries for 40+ years). The carrots were hit and miss. Some years they did great, but other years they did not grow at all or the roots were small (that is when I learn about thinning seedlings). For years I planted garlic in the Spring. I finally found out that it needs to be planted in the Fall in the climate where we live outside Chicago. All of my gardening knowledge was obtained via books, Google, talking to other gardeners and trial and error. Lately, however, I have been learning more about my edible gardening passion as I study to become a University of Illinois Extension Master Gardener Volunteer. Through these classes and volunteer opportunities I have realized that I have been doing a lot of things correctly, but even more things incorrectly. The biggest mistake I believe I have made is never getting a soil test. I was well aware of the possibilities of lead laden soil around my almost 100 year old home, so I built raised beds. Yet, beyond lead, I never thought of having my soil tested. For years I happily added compost, leaves, manure, mushroom compost and occasionally handfuls of organic fertilizers with abandon. It was a rite of Spring and sometimes for good measure, a rite of Fall, too. I never considered if my beds actually needed the amendments or what nutrients the soil and ultimately, my plants, required. Fast forward to last week. After spending a morning at the Cook County Farm Bureau and hearing about their fantastic services, I decided it was time to get my soil tested. The Farm Bureau has an arrangement with the University of Illinois Extension so if you sign a consent, your results will be shared with the Master Gardener volunteers that run the plant clinic . Then, as a free service, the Master Gardeners will be available to help you interpret your results. It is a great service and it is likely that you will need help with the interpretation (at least I did). As part of my training, I am learning to interpret these results, so if you happen to get me on the phone when you call for help, I apologize in advance. Obtain a soil testing kit. There are a few labs across the country that do soil testing but many university extension offices will help you get your samples to their preferred lab. Here in Illinois, the U of I Extension office has a list of labs that they will provide for you to contact. I found it easier to go through the Cook County Farm Bureau instead of contacting a lab directly because they provide you with a package all put together with everything you need. They gave me an educational packet of information, a pre-paid label with a box, proper collection bags and the paperwork that needs to go with your sample. They are also very friendly. I had to pay the sample fee when I picked up the packet (they also mail them to you, but I happen to be there) so be sure to figure out how many samples you plan to take before you call. Each sample cost me $20 because I am a CCFB member. I believe it is $30/sample for non members. Lead testing is a different fee. Fill out the forms with basic information like Name/address, etc. Then, answer a few questions such as “What will you be growing here?”, ” Have you applied fertilizer? If so, When? ” ,”Have you added organic matter?”, etc. There are about 6 or 7 questions on the form and you need to fill one out for each area of your yard/garden that you are sampling. Take your samples. There is a diagram that explains how to take the samples. If you have a veggie bed, you can take multiple cores from that bed and included it as one sample. In my case, I took 3 samples. One from each of my two veggie beds and one from my blueberry patch. In retrospect, I probably could have taken cores from each raised veggie bed and mixed those into one sample. Put your samples in the box they give you with the prepaid UPS label and call UPS for a pickup as soon as possible (or drop it off at a UPS location). The sample should not sit around or it will dry out and alter the results. I received my results in PDF form in about a week via email. It was that simple! It is always better to plant things that will grow well in your soil and in your environmental conditions than to try to drastically alter your soil! If your soil cannot easily support what you want to grow, consider using raised beds or pots. I hope to post some details about what my report actually showed for my garden and the actions I took. What do you think? Will you get a soil test this year? This entry was posted in Uncategorized and tagged Cook County Farm Bureau, fertilizer, Garden, master gardener, PH, Phosphorus, Potassium, raised beds, Soil, Soil test, University of Illinois Extension on April 26, 2013 by MamaGrows. 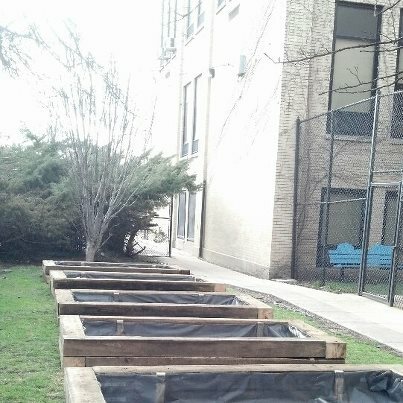 We built some garden beds at our school today. We have had a great little veggie garden the last few years, but it had a bit too much shade and bit too little access to water. A very dedicated teacher spent the summers watering it without much help and without a spigot nearby. So, our very generous PTO agreed to fund a new garden using some wood taken down during the construction of our new playground. The new garden beds will have more sun and are very close to water. My husband designed the beds and went to buy all the supplies last night with my oldest daughter (while I took a bath and the little kids watched a movie!). Then, a great group of volunteers spent about 4 hours today building 7 beds that are approximately 4ft. X 8ft. We lined the beds to keep the existing soil and contaminants from the wood out and will be getting a delivery of a high quality soil/compost mix in the next week or so. I think they turned out great. I cannot wait to start planting. I just hope the kids enjoy it. The best part of this project is that we hope to have families in our school community sign up to care for the garden for one week over the Summer. They will be responsible for weeding, watering and harvesting (for themselves or others) for their assigned week. If we do well, we hope to take some extra produce over to the Food Pantry. Does your school have a vegetable garden? This entry was posted in Gardening and tagged community garden, master gardener, railroad ties, raised bed, recycle, repurpose, school garden, vegetables on April 14, 2013 by MamaGrows.